diligent and to think critically. nurture wisdom and develop the capacity within students to examine all knowledge and all aspects of life in the light of Christian values. 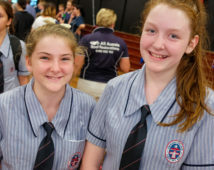 In Year 7, students study a set course where they have an opportunity to experience a broad range of subjects. 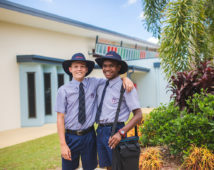 As they move into Years 8, 9 and 10, students study a number of core subjects, while having an increased opportunity to study elective subjects of particular interest. 3 elective subjects from the extensive range on offer. The OP eligible course allows a student direct entry into tertiary study. The Workplace Learning pathways (TER/SAT) are designed for students who do not wish to qualify for an OP at the end of Year 12. This course combines the study of school subjects with the opportunity to gain work skills through placement in a workplace or TAFE study. 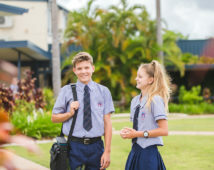 Year 12 students who are eligible for an OP must sit the Queensland Core Skills (QCS) test, while those who are ineligible may choose to sit the test. Click here for more QCS information. Students who have been identified with learning difficulties are offered assistance in a variety of ways and over time periods which are commensurate with their particular needs. 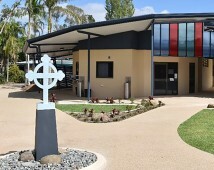 Learning at Emmaus takes place in a physical environment abound with the latest technology and modern learning spaces. Wireless internet throughout the College can turn any area of our campuses into a classroom. All learning spaces are enhanced with interactive whiteboards that allow teachers to deliver our curriculum in a way that is modern, responsive and practical. Supported by the 1:1 Laptop Program and the College’s broad use of online spaces, students can connect with their study and their peers anytime, anywhere. This is supported by a dedicated eLearning Facilitator on staff as well as four IT Helpdesk staff. Our dedicated Middle and Senior school libraries encourage collaborative learning within a contemporary, relaxed setting, and offer broad online and physical catalogues.